Why Spay or Neuter Your Pets? Where Do My Donations Go? Woofstock has extremely humble beginnings growing from a simple idea: have a musical event where dogs were welcome. Weeks of planning were dedicated to it. The first year, everything was handmade, down to the t-shirts that the volunteers wore! It was a lot of work, and a lot of love went into it! The proceeds from our first Woofstock went to buy food and supplies for winter. Seven years later, Woofstock continues to be the fundraiser which keeps our animals warm, fed, and fully vetted through the winter months. Thanks to those who chose to sponsor and donate, last year we were able to raise $10,200 for the care of our animals – that’s a lot of vet and utility bills -and it made 2017 our most successful Woofstock yet! This year’s event on Saturday, September 15th brings us to the Concordia Club in Gloversville, NY, a private club nestled in the woods in the foothills of the Adirondacks. Woofstock has become so well-attended that we have outgrown our previous space at Robin’s Nest in Broadalbin, NY. Because our little shelter is entirely fundraiser and donation-funded, your sponsorship will ensure that Woofstock will continue to provide the funding necessary to care for our animals. So what’s in it for you? Besides that awesome warm, fuzzy feeling you get when you’re helping a shelter full of homeless dogs and whole pile of foster kittens? Advertising opportunities: While the shelter is small (yet mighty), we have a very dedicated community that likes to support the businesses that support Regional. Allow us to introduce you to each other. 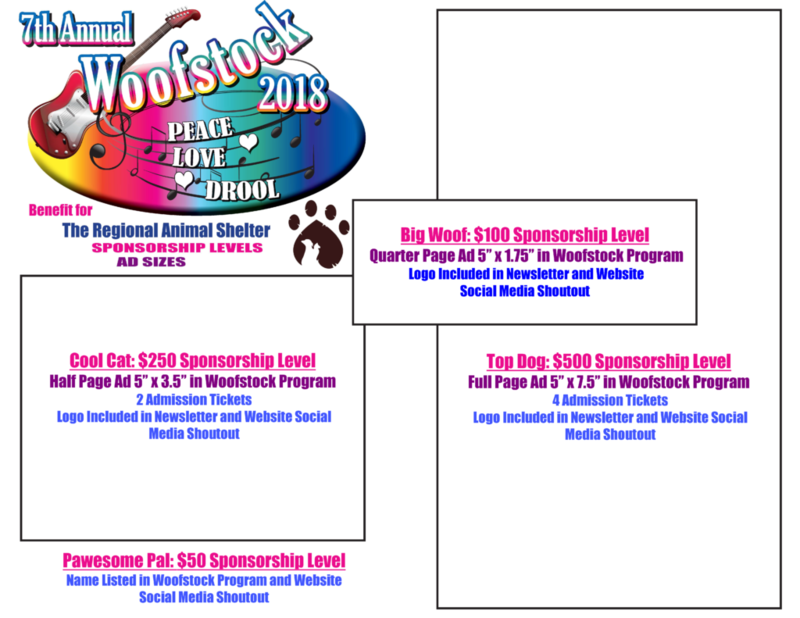 All event sponsors are listed on our public Woofstock event page. You can view last year’s Woofstock event page here. Listings for upper-level sponsors include varying sized logos and linking to a website or social media outlet. All sponsors and donors will be given a shoutout on social media on our main and event pages (over 7,700 likes on Facebook). 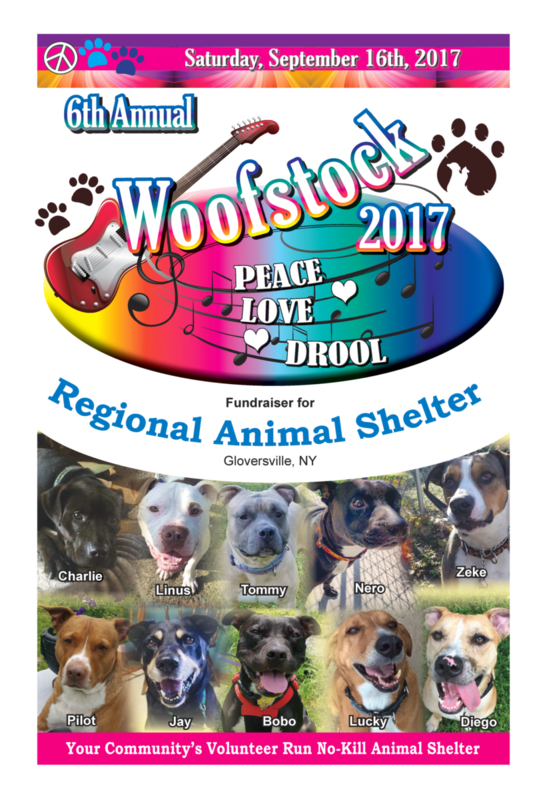 All sponsors are listed on the back of our Woofstock program – lovingly dubbed the Woofbook – over 150 were distributed last year. Upper-level sponsors have ads of varying sizes within the program – use is not restricted; feel free to add a coupon or discount code for new customers. Assistance with ad design is provided for those that need it. Take a look at last year’s Woofbook, which was designed by the wonderful Linda Palmieri of Creativity Unleashed! I want to be a sponsor. What do I do? All sponsors paying by check should submit a sponsorship form which can be found here (PDF). If you would like to use our secure, online form to make a sponsorship payment, you can do so here. All sponsorship inquiries and graphics can be sent to Cheryl: sky@regionalanimalshelter.org. Logos will be added online as soon as sponsorship payment is received. Please submit your properly-sized, full color ads and full-color logos no later than August 17th, 2018. © 2012-2019 Regional Animal Shelter, Inc.